Happy Easter! To celebrate we've hopped over to the Confections chapter at the end of the book to make these Marshmallow Eggs. Instead of Peeps, we have homemade marshmallows molded into egg shapes and coated in colorful sanding sugar. The process is a bit messy and sticky but when it comes to opening the eggs to reveal perfectly oval marshmallows, it is like a grown up's version of a reward at the end of an egg hunt. When my son was four years old, we went to visit relatives for Easter in the Central Valley. We had a picnic in a beautiful park next to a walnut grove. Our picnic spot was at the bottom of a hill and after our meal and Easter egg hunt my son and I went for a walk exploring the park. On our way back we decided to take a short cut and walk across the hill. At the foot of the hill we found an Easter egg and we talked about how it must have been left behind by some Easter egg hunters. We taught our son not to pick up things from the ground that were not his, so with his little foot he crushed the egg. As we walked up the hill and not a soul in sight, we found another and raced to crush it, then another and another back and forth many many times. We had so much fun laughing as we stepped on all the leftover Easter eggs. Just as we reached the summit laughing and out of breath, we spyed a group of children running towards us picking up Easter eggs that were scattered all over the place. We stopped in our tracks bewildered and realized what we had done. With confetti stuck to our sneakers, I grabbed his hand and we walked briskly back to our picnic spot. This memory came to mind while I was photographing these eggs yesterday. As I was setting things up one fell to the ground. I couldn't find it which I thought was strange. While packing up ready to leave, I moved my foot and found I crushed it. This time it was marshmallow all over my sneaker instead of confetti. Payback. This was the first time I worked with gelatin sheets. I'm finding that I am not apprehensive when working with new ingredients as I used to be before. This book is well written and well explained. I decided to only make the vanilla marshmallow eggs. The instructions were straight forward. What I found different was no baking which was nice for a change. The timing of whipping egg whites and making syrups at specific temperatures is now fairly easy since we have used this process before. I sprayed the plastic egg shells with nonstick spray and pipped in the marshmallow mixture on both sides then closed the eggs. They were slippery and difficult to close as I overfilled the shells on some eggs. The eggs sat over night. To decorate, I used large crystal sugar in Purple and Gold. I also used a gold dust powder as the first layer for a few eggs. I then rolled the eggs in the crystal sugar. I also use fine colored sugar. Making this was fun. I only wish my college age son (partner in crime) was here to make them with me. Ok, I was not very enthusiastic of doing this recipe. It had doom written all over it. I rarely make candy or confections, so this is a terrifying world to me. Being that it's Easter, it was super easy to find the plastic eggs. All other ingredients except the gelatin sheets are easy to find. The sheets were supplied by Jen. I strongly suggest to mise everything in place first. Don't start this without everything laid out. Also, thanks to Jen's tip, spray, spray, spray. Do not skimp on spraying non stick spray in the egg shells, as well as inside of pastry bag, as well as spatula. Recipe went down as written. I was really grateful for my All Clad saucier with the easy pour lip. This was the pan i cooked the sugar down in. It was easy to pour into the mixer. I did find though, at one point I must have poured too much at once as I ended up with a sugar rock at the bottom of the mixer. The sugar cooled too fast. Go slow! Made marshmallows. Went as written. I filled each half of the egg. I would recommend really filling them to the top and as the book says pipe from the bottom making sure you fill all of the egg. I had some holes in some of my eggs. I let them site out over night. In the morning....... judgement day. They popped right out of the shells. I was so amazed. Being that i didn't have the sugars to roll them in, I rolled them on powder sugar/cornstarch mix. As you can see by the pic, a few didn't get filled enough. Also, you see seams around the sides. These would have vanished had I used the colored sugars. I have eaten three now. After all, thats whats most important. How they taste. Delicious! I have made homemade marshmallows before but I have to say my first attempt for this assignment was a complete fail. The gelatin warmed over the stove too long, dried out and couldn't go back to liquid state. The sugar syrup got too hot (desperately needing the Thermapen that Thomas Keller uses) and when I added it to the egg whites the mixture was lumpy. My second attempt was much better, I warmed the gelatin at the last minute because it really only needs 1-2 minutes and monitored the sugar more carefully. I was really happy with out the marshmallow eggs turned out. I did various sizes and found the mini 2" ones were the best portion size. The regular Easter egg just seems so large and while I believe a homemade marshmallow is better than any store-bought, it is just too much to eat in one go. I also prefer the powdered sugar coating for eating. The sanding sugar makes the eggs beautiful and shimmery but texturally I didn't care for the crunch. I wonder if I used a finer sugar similar to that on Peeps it would be better. Other than that, I had so much fine coating them in different-colored sugars. The above shot has the marshmallows in Robin's egg blue, in a bed of toasted coconut. One of my favorite Easter treats is marshmallow Peeps. So when it was time to make our own, I knew I'd enjoy it. I've made marshmallows before, but never shaped ones. Using the sheet gelatin was a new experience for me, I'd only ever used powdered gelatin before. It was weird and slimy but neat to see how it transformed. When making the marshmallow mixture, it seemed kind of loose and grainy, but it turned out ok. I had a major meltdown when piping the marshmallow into the plastic eggs. I don't like getting my hands dirty, especially with sticky things. Now, I know marshmallow is sticky, but I didn't quite realize how messy this process would be. After filling each egg half with marshmallow, trying to close the two halves was difficult. If you overfilled them, goo would squirt from both the top and bottom holes, as well as the center seam. The book recommends wiping off the excess with a damp paper towel, which I tried to do. But it seems that once you get marshmallow on the towel, and try to use it again, you just end up spreading more marshmallow everywhere. I went through about 10 paper towels and washed my hands maybe a dozen times. I got almost 11 full eggs, so it seems I overfilled a few. After setting up overnight, I got to the best part- decorating! The eggs popped right out of the shells, and I rolled them in different colored sugars. I chose not to make my own sugars, since I have dozens and dozens of different colors already. I chose spring colors, white and yellow and orange and rainbow. The marshmallow eggs were super tasty! A crunchy sweet exterior with a light and fluffy interior. In the future, I might use a finer sanding sugar for the outside, but these were excellent. 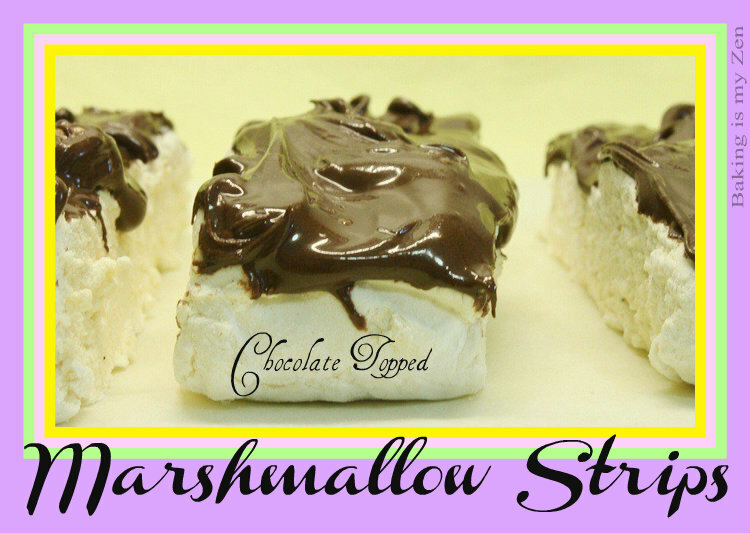 For me, It's not Easter without marshmallow treats!